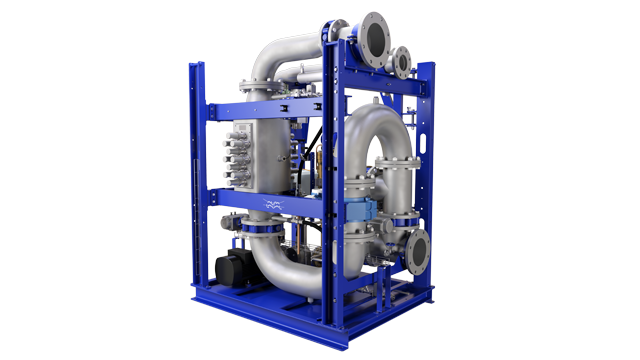 Specifically designed with the high standards and demands of the oil and gas industry in mind, Alfa Laval OF 900 is a compact centrifugal separator for separating solids – especially hazardous contaminants – from fluids, such as condensate, oil and/or water. It is ideal for tough separation cases where submicron particle contaminants (e.g. mercury and arsenic) need to be removed. 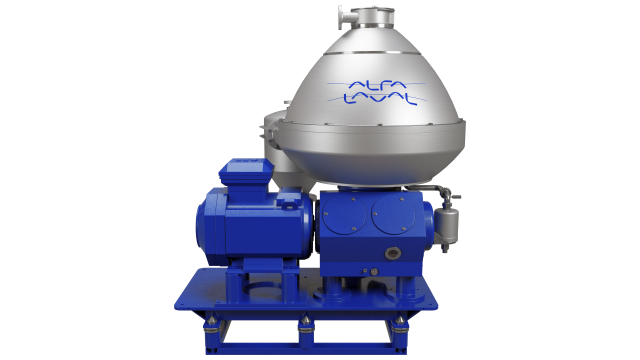 Two elements set Alfa Laval OF 900 apart from other centrifugal separators: a center-to-center flow path and the Hermetic Design. When it comes to process integration, both the inlet and outlet of Alfa Laval OF 900 are hermetically sealed by mechanical seals – Hermetic Design – preventing gas flashing inside the separator and eliminating the need for upstream degassing vessels. “These two features are what make Alfa Laval OF 900 the optimal choice for oil and gas process integration – every operation needs an efficient separation system that also saves energy and reduces risks,” remarks Joakim. With regard to its overall design, Alfa Laval OF 900 is similar to other centrifugal separators, meaning it consists of a machine bottom part – housing a gear drive and lubrication system – and a top part – featuring the bowl, bowl casing with cooling jacket and outlets for separated liquids and discharged sludge. To improve its long-term performance under all conditions, all of Alfa Laval OF 900 metallic parts – in contact with the process liquid – are produced from high-grade stainless steel. Equally robust are the gaskets and seals, which are made from Viton® (a brand of synthetic rubber and fluoropolymer elastomer).Together, these components ensure that Alfa Laval OF 900 provides an extra-long lifecycle with minimal maintenance requirements. The operation of Alfa Laval OF 900 is incredibly efficient. The process feed enters the centre of separator bowl from the bottom, via a hollow drive spindle, creating a liquid-filled, low-shear environment. The process liquid flow gradually accelerates into the bowl, keeping feed droplets/particles intact. This facilitates superior separation performance and greater product integrity – critical when handling emulsions or shear-sensitive particles. Separation takes place between the bowl discs where the liquid phase moves towards the centre of the bowl and the high G-forces force the solids toward the outside of the bowl. These solids are collected in the periphery and intermittently discharged via the discharge ports as the sliding bowl bottom moves downwards. They eventually leave the separator by way of a sludge cyclone. “The center-to-center flow of the OF 900 ensures that hazardous contaminants are extracted from condensate streams with high efficiency and no air entrainment,” explains Joakim. 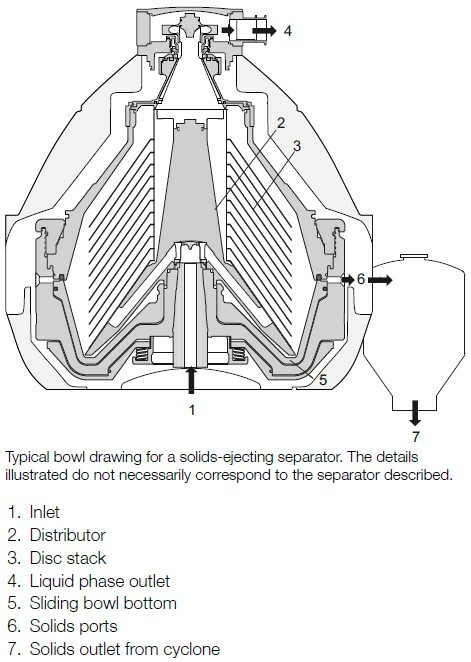 Lastly, the freshly separated process liquid leaves the bowl through the hermetically sealed outlet in the top of the separator under pressure – created by an impeller – eliminating the need for downstream booster pumps, in most processes. The center-to-center design with its short settling distances not only helps ensure a low hold-up volume, it also keeps the footprint of the centrifuge small – especially when compared to filter and coalescing systems. The Hermetic Design – completely encapsulating the process liquid – reduces the need for upstream degassing equipment, which also helps decrease space requirements. Another clear upside of Alfa Laval OF 900, and centrifugal separators as a whole, is its ease of cleaning and maintenance. The separator intermittently discharges solids of variable volume, which then exit the separator via a sludge cyclone. Unlike cleaning a filter, separated deposits are easily removed and disposed with minimal mess and human contact with hazardous material. Regarding maintenance, the disc stack of the OF 900 separator has been designed to be cleaned in place (CIP), further adding to the low total cost of ownership. “Companies looking for superior separation performance for problem feeds with submicron particle contaminants, such as mercury and arsenic, should definitely consider Alfa Laval OF 900,” concludes Joakim.